us, not from other's opinions of us. I just now read this scripture on another blog. I suppose God really wants me to get this. It is hard to realize that God takes delight in me. I am trying to embrace it. 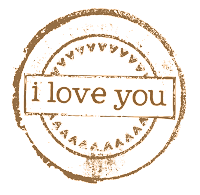 Love the I Love You stamp.